Fortitude is one of the four virtues of antiquity. It means strength, endurance and the ability to confront fear, uncertainty and intimidation. Fortitude is steady, reliable and unwavering. Fortitude is solid as a rock… or, in the case of Fortitude Brewing, solid as a mountain. “An accountant and a cardiologist walk into a bar…” sounds like the start of a bad joke, but “An accountant and a cardiologist start a brewery” is a true story. Jim O’Connor and Ged Connors have been mates since they were at school together, and had shared a dream of opening a brewery together for almost as long. So, in 2012, they started Fortitude Brewing, beginning with a small system in a defunct brewery on Tamborine Mountain, up in the Gold Coast hinterland. Tamborine is one of those quaint townships with a fudge shop, a German cuckoo clock shop (why is there always a German cuckoo clock shop? ), dreamcatchers galore, a small population and a fluctuating tourist trade. The cool air makes for pleasant summer days that cry out for beer so Jim and Ged started Fortitude with a simple but significant vision: to bring good beer to the mountain. They weren’t interested in chasing trends or novelty, but in solid, consistent, flavoursome beers. In their humility, the Fortitude team didn’t anticipate such rapid and remarkable growth. From the get-go, they netted multiple awards for their beers, landed beers in the top 15 of the Hottest 100 Aussie Craft Beers, and created demand that reached far beyond the cosy cottages of Mt Tamborine. So in 2014, they moved to their current premises in Eagle Heights, taking over the site of the former Mt Tamborine Brewery and thus upgrading to a 24hL system to allow for further growth via a secondhand Czech brewhouse that’s proved itself to be a real workhorse. The new location also provided a more welcoming establishment to the public. The phrase “mountaintop experience” typically refers to a moment of transcendence, an epiphany, a vision of greatness… and that’s a perfect description of what happens when you approach the front of the brewery, and ascend the expansive steps to the arched entranceway. As you walk through the great corridor, dwarfed by the vaulted ceiling – timber rafters looming over you – you can’t help but wonder what this grand structure is. Is it a Norse long hall? Is it a barn? Is it a cathedral where devotees can worship at the altar of good beer? No, it’s a brewery. Come on. You knew that already. But thanks for playing along. The public-facing bar has an array of tables spread through the indoor-outdoor area, spoiling you for choice. Will you sit at a picnic table in the open courtyard, surrounded by greenery and perched closest to the stage where live music plays every weekend? Or beneath the slanted roof, among the hanging plants, at a bar table built from an old Mt Tamborine Brewery keg? Or will you keep warm inside, at a long table or on the leather couch, admiring the brewing tanks while you drink of their precious contents? Whatever your seating choice, you have access to 15 glorious taps. They always serve up the Fortitude Brewing core range – Pacer, Lager, Summer Ale, Pale Ale, and Stout – and the Roots and Leaves Hopped Ginger Beer (arguably one of the best beer names ever). And, at any given moment, there are a few taps dedicated to whichever Noisy Minor beers have been brewed recently. A lazy afternoon at the brewery begs for a tasting paddle matched with something to nibble. The pizzas made onsite at Fortitude are of a deliciously high quality (which experience suggests isn’t always assured in hinterland townships), and the neighbouring cheese shop offers boards and platters to complement an assortment of beers. When you finish your session at the brewery (which, let’s be honest, is probably at closing time), there are a few options available for taking some beer home with you. Growler fills are offered for any of the beers on tap and packaged beer can be bought over the bar: stubbies of Fortitude core range; 375ml cans of Roots and Leaves; 500ml cans of Noisy Minor beers. 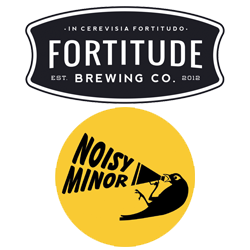 And, as it’s continued to grow, Fortitude's ethos of integrity and honesty remains, with the team intent on being transparent about their beer's freshness, putting packed on rather than best before dates on all kegs as well as Noisy Minor cans. “I don’t know how many people look at it," says Jim. "But, particularly with the Noisy Minor range, when someone’s dropping the sort of dollars they do on an IPA or an imperial IPA, they care. They’re gonna take a bit of extra notice. And the craft bars care about the freshness."